If you are the nation’s premiere energy efficiency research organization and you want to make your highly technical findings interesting to the public and energy professionals, what do you do? In preparing for the release of the American Council for an Energy-Efficient Economy’s latest report – the 2013 City Energy Efficiency Scorecard – Resource Media came up with the idea of creating an interactive infographic to provide both lay and technical audiences a more engaging and easy way to navigate report key findings than a static written document. Identify the data that supports that story and eliminate data that does not fit. In other words, get rid of so-called “background noise” that may interfere with your headline. This was ACEEE’s first time creating an interactive graphic and we were honored to work with ACEEE and lowercase productions on this project. As we developed the infographic to support the report, it was important that audiences could simply click on a city to pull up that city’s overall and individual policy-area scores and ranks, rather than sort through multiple tables and spreadsheets. ACEEE’s primary goal with publishing this report was to recognize cities’ for their efforts to save energy and demonstrate that all cities – no matter how they scored – have an opportunity to save even more. 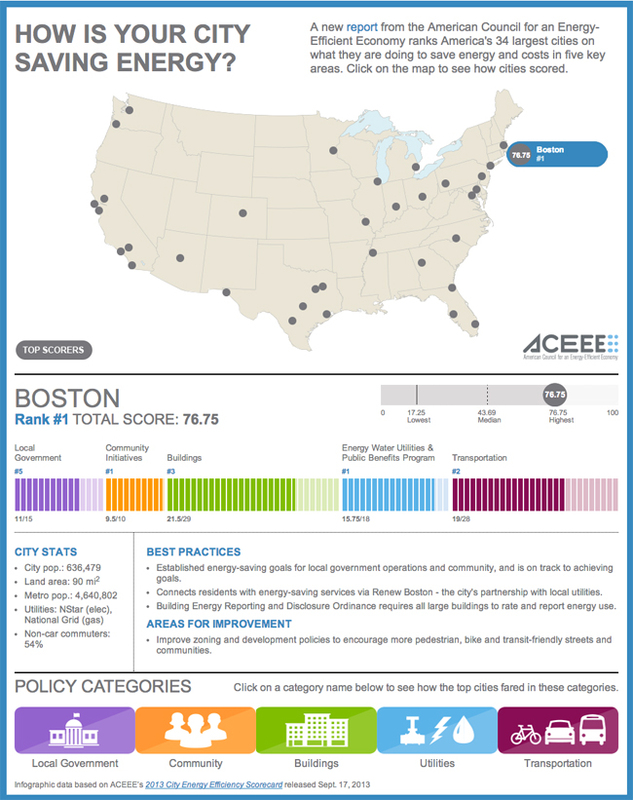 Although Boston was the top-ranked city, ACEEE also wanted to recognize the many other cities excelling in energy efficiency. The infographic helped ACEEE achieve this by providing snapshots of the top performing cities in each policy category. Organizing the results this way helped ACEEE generate local media coverage across the U.S. from Seattle to Austin touting cities’ performance in different categories and how they performed against each other. In just the first few days after the report release, more than 6,000 people have already visited ACEEE’s City Scorecard webpage and graphic. Know of other good examples of interactive report graphics? Let us know in the comments section below! And for more tips on creating shareworthy infographics, check out our 5-step guide.